Brew tea bags by steeping in 6 cups hot water for up to 5 minutes. Remove and discard tea bags and chill completely. Puree peaches, lemon juice and ¼ cup sugar in a food processor. Strain through a fine mesh strainer into a bowl, discarding solids. Set aside. Make a simple syrup by combining remaining ½ cup sugar in a small saucepan over medium heat, stirring until sugar is dissolved. Remove from heat and let cool completely. Pour chilled tea, peach puree, simple syrup, gin and bitters into a pitcher, stirring to combine. Refrigerate until well chilled. To serve, fill glasses with ice, top with iced tea mixture and top with a float of Champagne. 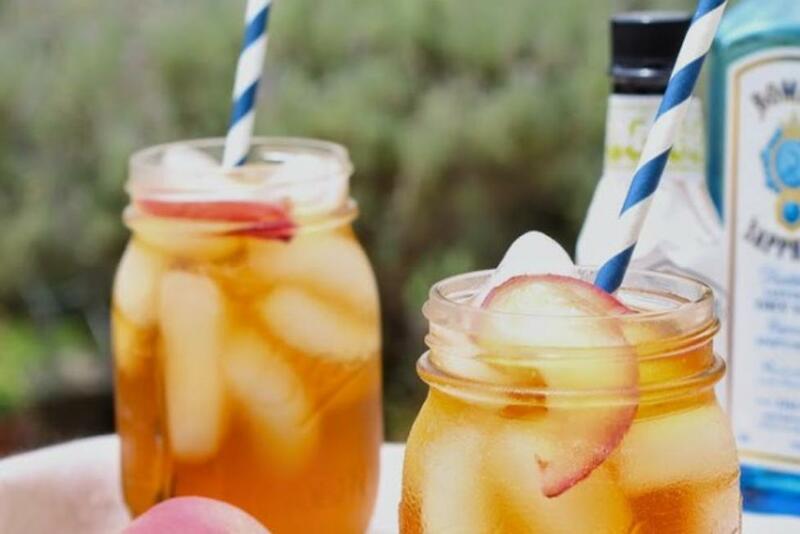 Garnish with peach wedges.